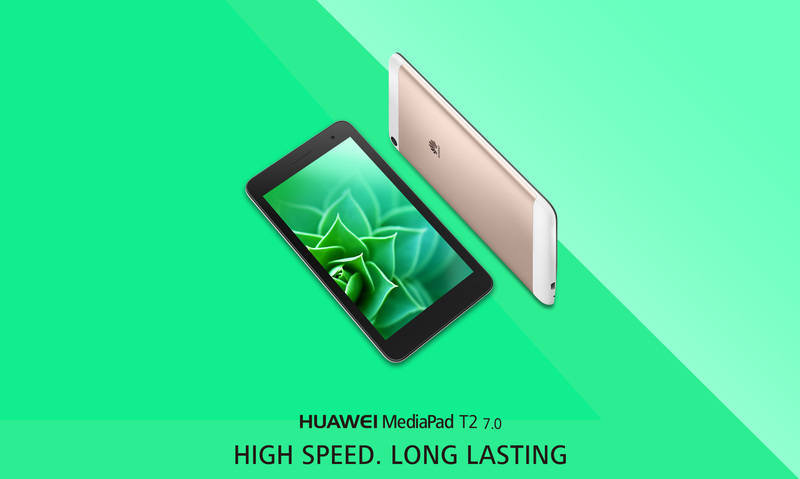 The HUAWEI MediaPad T2 7.0’s powerful quad-core 1.5 GHz A7 processor allows for a thrilling data connection speed of 150 Mbps (4G LTE), putting the world at your fingertips. Stay connected with family, friends, fans and your business at the speed you deserve, while sharing and exploring in a whole new way. The HUAWEI MediaPad T2 7.0’s 4,100 mAh lithium polymer battery provides an enormous well of power, giving you the freedom of 455 hours of standby time, up to 7.9 hours of web browsing and up to 11.9 hours of video playback. Make battery problems a thing of the past. * Please check further information about the data in Specification table. The HUAWEI MediaPad T2 7.0’s attractive design and aluminium body construction blends elegance and strength into a 278 g, 8.5 mm tablet. The cutting-edge construction and durability makes it easy to use and striking to look at. The 7-inch IPS display is capable of producing an eye-popping 16 million colours through its 600 x 1024-pixel wide super video graphics array (WSVGA) that packs 169 pixels per inch. See the world as it was meant to be seen, in all its bright and vivid tones.